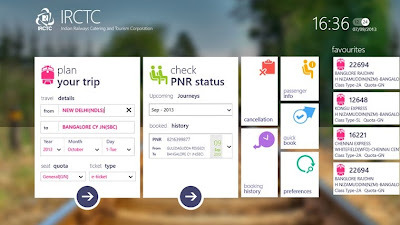 Indian Railway Catering Tourism Corporation (IRCTC) has launched its app for Windows 8 PC, Tablets and smart smartphones. The app allows users to book Railway tickets and offers other services like checking PNR status, train schedules, train routes, availability of tickets, cancellation, booking history and more. IRCTC is the leading e-commerce site in India, lets you book train and flight tickets in online. It gets almost 12 million unique visitors per month and one out of five internet peoples in India visits IRCTC.co.in. Due to huge traffic IRCTC site upgraded with high capacity server to handle 4.15 lakh tickets daily. Now it released app for Windows 8 devices. With this app you can do all following tasks on your Windows 8 devices.